Buea-based ERUDEF, Environment and Rural Development Foundation, has opted to collaborate with the Southwest Regional Delegation of Forestry and Wildlife in making the "Lebialem – Mone Forest Landscape" proposal for a conservation area come to fruition. This is in line with government efforts through the Ministry of Forestry and Wildlife, MINFOF, to extend protected areas in the country. 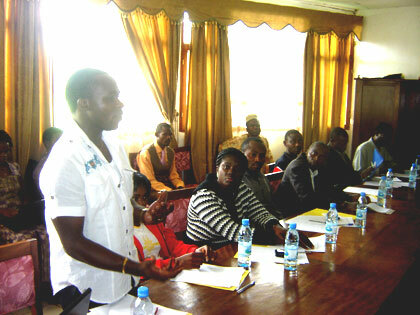 At a workshop in Buea recently, Grace Mbah, Southwest Regional Delegate of Forestry and Wildlife, explained that ERUDEF’s proposals are in tandem with the Forestry and Environment Sector Programme, FESP, and the Biodiversity Strategy for the management of montane ecosystems in Cameroon. "Component three of the FESP, which has to do with Biodiversity conservation, is considered to be relevant to the context of the Lebialem Highlands/Mt. Bamboutos Biodiversity Conservation Programme, which is within the Lebialem – Mone Forest Landsacpe," she said. Mbah said the management of the aforementioned ecosystem is being designed to be accomplished in synergy with other surrounding protected areas, which serve as refuge for biological populations. These protected areas, she enumerated, include; Mone Forest Reserve, Banyang-Mbo Sanctuary, Santchou Game Reserve and Mt. Bamboutos Forest Reserve. "These highlands constitute a very fragile ecology and sensitive areas that need special protection," the Delegate said. She enjoined ERUDEF’s management and participants to come up with strategies that will be put in place to continue the process of the creation of the Bechati Community Sanctuary, the Bechati-Mone Forest Corridor, the Mt. Bamboutos Integral Ecological Reserve and the Lebialem Highlands Important Birds Area. ERUDEF Director, Louis Nkembi, said they have been galvanising efforts to create a sustainable biodiversity management programme for the Lebialem Highlands/Mt. Bamboutos Ecosystems. "Besides the series of surveys we have conducted, we are at a point where we have to create legal systems to permanently protect these landscapes and the remaining forest blocks. Encouraged by government policy, we are joining forces to make sure that these fragile ecosystems are properly managed in collaboration with the local people," Kembi said. He challenged the government to lend more support, while reassuring that there is more ERUDEF can do for the betterment of Cameroon’s conservation policy. Participants resolved amongst other things that ERUDEF operations should take advantage of existing government and World Bank instruments on the promotion of conservation as well as educate the local community on the importance of biodiversity resources and conservation. ERUDEF has pulled national and international support to lay the groundwork for the creation of a system of protected areas in the Lebialem-Mone Forest landscape that will go a long way to support sustainable development in the concerned areas in the Southwest and West Regions. Since 2006, ERUDEF has championed the development of a pilot community model for the management of great apes at Bechati-Lebialem forest, which will be tested and replicated to other sites in the Lebialem-Mone Forest Landscape and subsequently to other parts of the country.